Looking for a meaningful Spanish surname name with style to spare? Consider Cruz. Thanks to D. for suggesting our Baby Name of the Day. Cruz is heard throughout the Spanish and Portuguese-speaking world, though most commonly as a place name or surname. It comes directly from the Latin crux. Similar words are found in many European languages: croix in French, croce in Italian, kruis in Dutch. 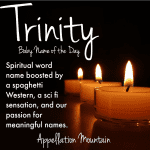 The name carries a deep spiritual meaning, too, referring to Christ’s crucifixion. History plays a role, too. In 1492, following years of religious persecution, Ferdinand and Isabella issued the Alhambra Decree. Jews in their kingdom had to convert or leave – now. Known as conversos, many had already converted publicly, though their private worship and beliefs varied. The crown regarded new converts with suspicion, and as a result, overtly Christian surnames were adopted – at least some of the time – for protection. It might be heard as a girls’ name, too, sometimes in combinations like Mariacruz. Dozens of places wear this name, throughout Latin America and the United States, too. Mexico’s Veracruz – true cross – and California’s Santa Cruz – holy cross – both come to mind. Other places bear the same or similar names. Because many families took their surnames from their hometowns, that’s another reason that we find the surname in such steady use. Conservative Texas senator, and recent Republican presidential nominee hopeful Ted, born Rafael Edward. The sixteenth century Dominican friar, Gaspar de la Cruz, who traveled to Asia and penned one of the first detailed accounts of China. And lastly, British rapper Taio. As for the given name, you might think of former Lieutenant Governor Cruz Bustamante of California. Or probably, you’re thinking of the youngest of the Beckhams’ three sons. Victoria and David Beckham welcomed their third child in 2005. At the time, dad David was playing for Real Madrid, and the couple indicated that they wanted a name with Spanish influence. I’ve also read that they were friendly with Tom Cruise, and Cruise’s surname struck the couple as an appealing choice. In 1984, actor A. Martinez joined the cast of Santa Barbara as a character called Cruz Castille; he won a daytime Emmy for the role. Martinez played Castillo for over 1,300 episodes, and went on to have a long, successful television career, including appearances on several other soap operas. Credit Martinez’s character with cementing Cruz as a mainstream baby name possibility. Prior to the 1980s, it was used in sparing numbers. After 1984, the name was given to at least 100 boys every year, rising from the fringes of the Top 1000 to the solidly established. The Beckhams’ considerable star power pushed the name into the Top 500 a year after their third child’s birth. Parents embraced the ‘z’ sound. With so many families seeking crossover English-Spanish names, doubtless that was another part of the appeal. Overall, Cruz combines many a desirable quality. Mixing spiritual meaning, surname style, ties to the map, and that cool letter ‘z’ makes for an edgy, interesting name. While this one feels quite modern, it also seems like a choice with roots, and a story to tell. As of 2015, Cruz had fallen slightly, given to just 1,060 boys in 2015. And yet, this choice remains an intriguing twenty-first century, culture-spanning possibility for a son. 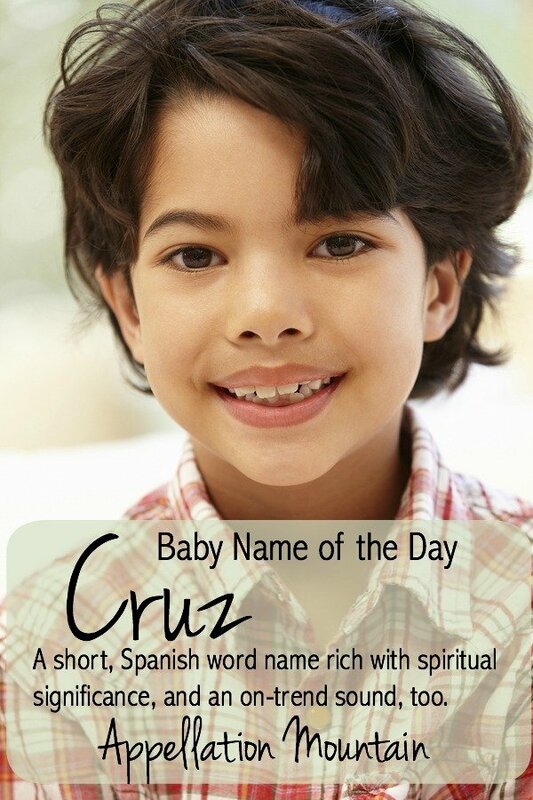 Would you consider Cruz for a child’s name? This post was originally published on May 12, 2008. Substantial revision and reposting took place on July 18, 2016. My husband and I have a Cruz! My husband is of Spanish and Portuguese heritage and my great grandfathers name started with a C, so Cruz was a good blend for us that encapsulated heritage with a beautiful sound and spiritual meaning. To me it’s like naming a girl Faith as far as meaning goes. We love it and he seems to love it too! To me, the major problem with Kruz is that K! Not klassy. And Ramos and Ramses do seem pretty outlandish and tough to wear – even by my liberal standards. Kaia is so common that I’m less inclined to think about its origins. After all, I know little girls called Emma Rodriguez and Katelyn Castillo. But overall, you raise a good point. I wouldn’t choose a given name like Kimiko or Kiet, because we haven’t a drop of Japanese or Thai blood. While I don’t think it’s wise to weight meaning too highly, it *is* a good idea to think about history and usage – and whether it is reasonable to see your child as a Tuesday, a Tallulah, a Caspian or a Cruz. It’s one thing to hear a name on TV and do some research … but to hear it on TV, guess at a reasonable spelling and slap it on your kiddo forever and ever, amen? Not a great plan. Of course, funny things happen. A half-Japanese and very exotic-looking friend of mine named her daughter Midori. 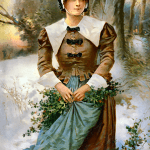 While her husband is of European descent, he’s fairly dark, too, so it was a safe bet that the name would fit. At the same time, I think the reasons you’ve presented make a lot of sense, I don’t hate the idea at all. I just associate Cruz so strongly with the Kruz I knew, so it seems a bit flimsy to me personally. […] Cruz – The Beckhams put this name on the map. […] but fell out of favor, leaving the rankings by 1976.